There is little question that the classroom is the most prominent place on any university campus. With all of the frequent changes in technology utilized in the educational process, our classroom equipment requires constant attention to make and keep SMU on the cutting edge of what’s needed to shape the next generation of world changers. OIT has taken immense strides over the summer to update and improve classrooms across campus. One of the largest projects has been to consolidate the multiple types of control systems into fewer and simpler configurations. 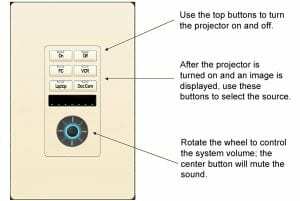 This means that no matter what classroom you’re in, the controls for the audio/visual equipment will be the same or very similar. Plus the controls will be easier to understand and more reliable when it matters most. The instructions for the most common classroom interface is here. In addition to in-room improvements, OIT is building out a new support system that allows support staff to control and troubleshoot A/V issues remotely – drastically reducing wait times at a time when getting a class started quickly is critical. This new configuration can also allow for preparation before an event, so all needed software and files are ready beforehand. Also, as part of OIT’s new shared services model, you can expect quicker response times for in-person classroom service calls with trained personnel stationed across campus instead of in one central location. It’s our job to make sure that your classroom equipment works the way you need it whenever you need it. If this is ever not the case, please don’t hesitate to call the Classroom Support Services line at 214-768-8888 to have a technician immediately dispatched. You may also direct any other inquiries about classrooms to the Help Desk at 214-768-4357 or help@smu.edu.